A conservative historian, Keith Windschuttle, conversely complains that this is an improper conclusion to draw from fiction. In May 1995 I gave a paper to a seminar in the Department of History at the University of Sydney, Australia. Although most of the postmodernists in the department declined to attend, they deputized one of their number, Alastair MacLachlan, to reply and, they hoped, to tear me apart. My respondent opened his remarks by citing Foucault and the Chinese taxonomy. Didn’t I realize, he chided, that other cultures have such dramatically different conceptual schemes that traditional assumptions of Western historiography are inadequate for the task of understanding them? There is, however, a problem rarely mentioned by those who cite the Chinese taxonomy as evidence for these claims. No Chinese encyclopedia has ever described animals under the classification listed by Foucault. In fact, there is no evidence that any Chinese person has ever thought about animals in this way. The taxonomy is fictitious. It is the invention of the Argentinian short-story writer and poet Jorge Luis Borges. This revelation would in no way disturb the assumptions of the typical postmodernist thinker, who believes that the distinction between fact and fiction is arbitrary anyway. Foucault himself openly cites Borges as his source. The example is now so frequently cited in academic texts and debates that it is taken as a piece of credible evidence about non-Western cultures. It deserves to be seen, rather, as evidence of the degeneration of standards of argument in the Western academy. That is, this has nothing to do with real Chinese knowledge demonstrating the relativity of the West, but is rather about the West [via South American urbanite] proving a point to itself through its own fiction. I am not claiming that Foucault himself was trying to make this rather inane argument for relativism, but those who read Foucault religiously are making that argument, as Windschuttle attests. They do this for a reason. ‘Various Manifestations’ rather vaguely indicates the contents of this section, and Klaproth and Mayers have been misled into translating the title [as] ‘Divination’ and ‘Natural Phenomena’ respectively. As a matter of fact, the phenomena recorded are all of a strange or unusual character, departing from the ordinary course of nature. They include prodigies of various kinds, eclipses, plagues, floods, droughts, dreams, and so forth. Borges almost certainly read this document or something much like it. It all sounds very mystifying and exotic, demonstrating the relativism of truth… until you read the next sentence. The first four sections form a group conceived as relating to Heaven and its manifestations, as a contradistinction to Earth on one hand, and Man on the other. It is not the way we would write an encyclopedia today, but a medieval European division of knowledge would not be terribly different from this. The terms “economy” (経済) and “society” have even undergone the same modern transformations in Europe and China. The differences arise from different focuses: the triad of heaven, earth, and man being paramount in the medieval Far East. What this appears to demonstrate is not that all cultures are the same, which is Windschuttle’s vague point, but that differences in culture arise from an implementation of traditional principles which are not “arbitrary” but metaphysical in nature and perfectly comprehensible. Borges, who either did not understand the structure of the Chinese encyclopedia or wished to obfuscate it to make his point, represents perfectly not any actual knowledge about the impossibility of knowledge (as Foucault would claim), but the modern alienation from Tradition and the way of seeing it as confused and meaningless. My discussion of the issues involved with “choosing a religion” has been published on Gornahoor. This essay is intended for people who have read René Guénon and understand his concept of “Tradition”. Ichigen koji (一言居士): A person who has something to say about everything. Japanese shrines, called jinja, have a poor relation to the Western view of religion. Japanese people often complain that shrines are improperly viewed as religious, owing in great part to a legal intervention by the American Occupation. Having researched this in an academic capacity for several years, I will now state for the record that it is meaningless to list “Shinto” as your religion, because there are so many views of the jinja and ways of the kami, and none of them is officially endorsed by any establishment. You should rather put “Japanese” as your religion if you want to act like one. However, it is possible to be a “Shintoist”, that is, a researcher who studies Shinto history and expresses views about kami. 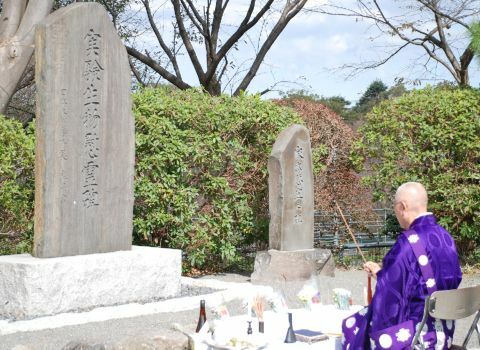 The postwar organization created by the American Occupation, called Jinja Honcho (“Shrine Authority”), is often assumed by both scholars and amateurs to propound an orthodox theology, when in fact it does not endorse any religious views at all, but only encourages an orthopraxy of respect towards shrines which Japanese people naturally have anyway. Obsessing over Jinja Honcho, as some Western books have done, gives you a very limited perspective on shrines in the public mind. Independent shrinekeepers legally own all 80,000 shrines of Japan and can basically run them how they like. The majority of full-time shrinekeepers are atheists trained in Jinja Honcho-linked universities as ceremonial specialists whose main interest is continuing tradition, with an occasional view to historical awareness, or in rare cases attracting new worshipers with advertisements. Jinja Honcho has organizational influence over the shrines but their main concern is continuing traditions. All shrines are privately run and free to leave Jinja Honcho at any time. It should be noted that Jinja Honcho sponsors the Shinto Political League, which is, as the name implies, a right-wing political organization that, rather than propounding religious doctrine, calls for the restoration of imperial era traditions and practices, and espouses right-wing political views generally. Its mission statement says that it “aims to convey Japan’s culture and traditions to future generations”. Public and legal opinion control how shrines are treated in government and by the courts. The general public sees shrines as an old public institution with vague links to history and religion. Ordinary people visit their local shrine roughly twice a year, for holidays and special occasions. Books about shrines from the “public opinion” side are often about issues surrounding Yasukuni Shrine. Supporters’ organizations are set up by frequent shrine visitors and donors as independent groups to control how individual shrines are run, most notably at Yasukuni Shrine in Tokyo. These are basically non-religious groups. Hobbyists are often atheists with a mania for medieval architecture and sculpture. They do not exert any control over shrines but write a lot of books about them. Surprisingly, I recently met a foreigner who falls precisely into this category. Spiritualists are a tiny minority of Japanese people who hold strong religious faith in shrines and donate a notable amount of money to them. Their view of shrines is often vague, and similar to that of the general public, except that they see them as old religious institutions that house powerful beings. Shrinekeepers do not cater to these people whatsoever, since they see their mission as public and not religious. Occultists, who I might also call independent Shintoists, promote an eccentric intellectual view of shrines, often linked to martial arts, kotodama, parahistory, or the Oomoto movement. While they engage with Japanese history and occult tradition much more than spiritualists, they are fundamentally disorganized independent researchers. Their books can be found at large bookstores in the “UFO/occult/conspiracy” section. The Shinto Kokusai Gakkai is a private organization linked to the religious group Worldmate which encourages awareness of shrines and belief in them. Worldmate, the brainchild of Toshu Fukami, is an interesting group which sells “spiritual services” to people but also encourages people to worship at shrines, which they have no control or social influence over. Worldmate is a rather large religious movement but is extremely poorly documented by religious scholars. I have never seen a shrine acknowledge them (see “spiritualists” above). Buddhists and friendly new religions treat shrines with respect but focus on their own objects of worship. Unfriendly new religions and some Christian sects prohibit members from visiting shrines, but this is very rare. Japan only has a handful of medievalists, academic Shintoists, and religious scholars but they obviously promote a view of shrines to the general public as well. When a Japanese or foreigner claims that they are “a Shinto” they usually mean that they fall into the spiritualist group. But let’s not be so hasty. If you would like to study the Japanese occult you can become an occultist, or if you want to learn about Toshu Fukami’s theory of the universe (which is very interesting), you can join the Shinto Kokusai Gakkai and be a sort of superpowered spiritualist. These other categories are equally part of “Shinto” in that they are interested in shrines and want to promote respect for them. Furthermore, documenting shrine architecture and history is an equally important part of preserving tradition, so hobbyists and spiritualists should be friends. 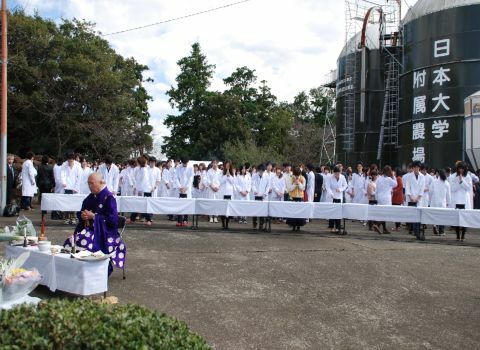 A memorial service for laboratory animals that died in medical experiments, held on November 2, 2012 by the faculty and staff of the College of Bioresource Sciences at Nihon University. At left, the memorial marker for the animals. A Buddhist priest prays for the repose of the animals’ souls. Such ceremonies are held annually at most Japanese universities. On Japan’s 1000 yen bill is a picture of someone named Hideyo Noguchi. He is remembered in Japan for overcoming a humiliating deformity and discovering the bacterial agent of syphilis. He worked for many years in America, often doing his research alone and avoiding confrontation by his peers. His methodology was flawed and most of his other work has been proven faulty or useless. This seems like important but not exactly the work of a national treasure along the lines of Jefferson and Lincoln, until you learn that he was a guy who loved getting awards, and went all over the world receiving awards from presidents, kings, and queens. The Japanese who Europeans and Americans want to see is the sniveling mandarin, constantly retreating and apologizing, grateful and overwhelmed by treats and prizes from his white masters. This is a Japan that buys its way into a space on the international stage, through paying for 20% of the upkeep of the United Nations and other expensive tickets, and receives no authority in return, so that its interests can constantly be ignored in the Security Council. It is a Japan that can deserve our pity, as it did in the 2011 tsunami, but never our respect, and like the constantly rotating prime ministers it is easily forgotten; the servant of the day. The Japanese who Europeans and Americans do not want to see is Yukio Mishima, a man who articulated and understood his own principle, and then transcended it; the kamikaze fighters, who, without ever hearing the words mors triumphalis, realized the heroic principle of the Roman warrior in the 20th century. The prospect of a foreigner who embodies fear and respect made “world opinion” very uncomfortable, and this type has been almost totally weeded out at present. Noguchi, who was always respected, has become a 21st century hero and children are expected to imitate his dogged pursuit of “world opinion”. But when the Pax Americana ends, it will become suicidal to bow before “world opinion”, and in the East Asian territorial disputes we are seeing very early stages of preparation for that time. So, let the overseas newspapers clamor and cry. The future needs warriors, not mandarins. 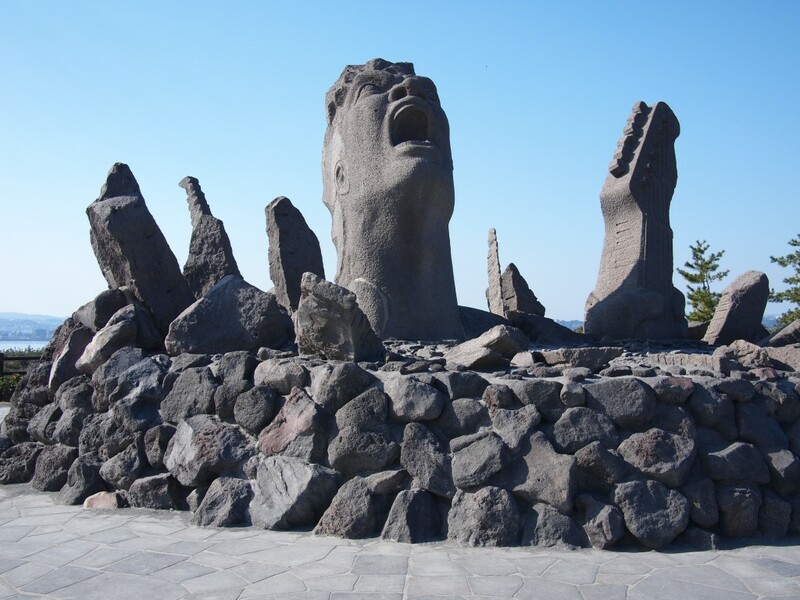 I doubt many people in America know who Noguchi is or can tell you the names of recent prime ministers. A much larger group of people know who Mishima is, and everyone knows the meaning of “kamikaze”. ALBERT. Deacon was on about th’ “rain of quantity” today. POGO. Rain’s been heavy around these parts. PORKYPINE. This hooricane is gonna flood the whole swamp, an’ we’ll all be drowned. POGO. It’ll be a pity if none of us gits to see the rainbow.